Want to see what’s going on in the kitchen while also keeping your eye on the score? Choose a chair fitted with a swivel base. A swivel base creates a chair that can easily move side-to-side, always giving you the best view of the action. 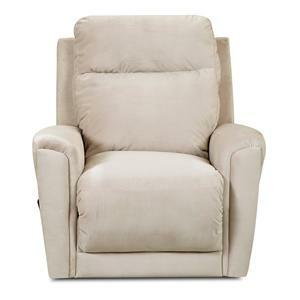 Use this swivel rocking reclining chair to update your home with a comfortable seat and look. 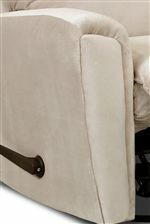 Fully padded chaise seat brings you comfort from head to toe while tufting adds detail at the top and bottom. The foam cushion provides a comfortable seat and sloped track arms on either side give the piece a transitional look that can be incorporated in your living space. The Priest Transitional Swivel Rocking Reclining Chair by Klaussner at Hudson's Furniture in the Tampa, St Petersburg, Orlando, Ormond Beach & Sarasota Florida area. Product availability may vary. Contact us for the most current availability on this product. Arm Inward sloping track arms. Padding & Ergonomics Arms padded with foam or white polyester cotton. Contour of arm formed with edge roll. The foam cushion can begin with several different types of foam ranging from 1.5 to 1.8 density. Once the foam is cut into a particular shape, it can then be wrapped with a low melt bonded polyester fiber wrap. The Priest collection gives you a variety of recliner options with transitional style. 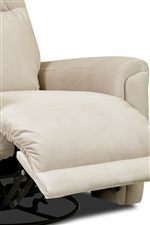 Various bases allow for the movement and motion that you want and that is most comfortable for you. Power recline option makes sitting back and relaxing easier than ever. Use a recliner from the Priest collection to update your home with a comfortable and stylish chair. The Priest collection is a great option if you are looking for Transitional furniture in the Tampa, St Petersburg, Orlando, Ormond Beach & Sarasota Florida area. Browse other items in the Priest collection from Hudson's Furniture in the Tampa, St Petersburg, Orlando, Ormond Beach & Sarasota Florida area.